The Irish and How They Got That Way, by Frank McCourt, original music arrangements by Rusty Magee, additional musical arrangements by Kirsten Salpini, with Scenic Design by Shelley Barish, Costume Design by Brittany Rolfs, Lighting Design by Karen Perlow, Sound Design by John Stone, and Rachel Sturm, Production Stage Manager, Kirsten Salpini, Music Director, and Dawn Simmons, Director, ran March 8-25, 2018 at the Greater Boston Stage Company in Stoneham, Massachusetts. Playwright Frank McCourt is best known for his Pulitzer Prize-winning bestseller, Angela’s Ashes, a stunning memoir and tragedy about his childhood in Ireland in the 1930s and 1940s. 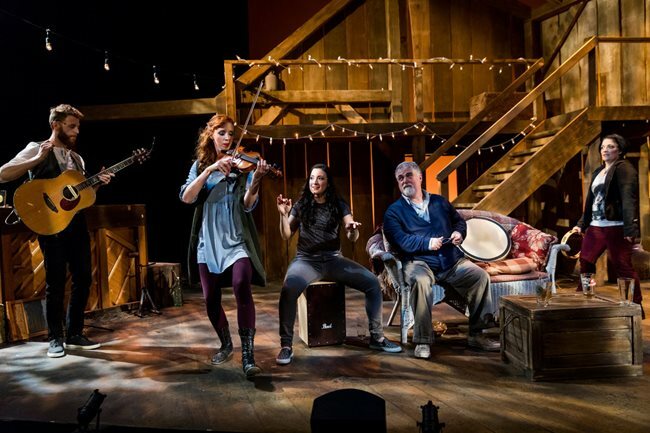 Now the Greater Boston Stage Company brings his 1997 play, The Irish and How They Got That Way, to Boston, following a show at the Somerville Theatre in 2013. The show doesn’t follow a traditional format. 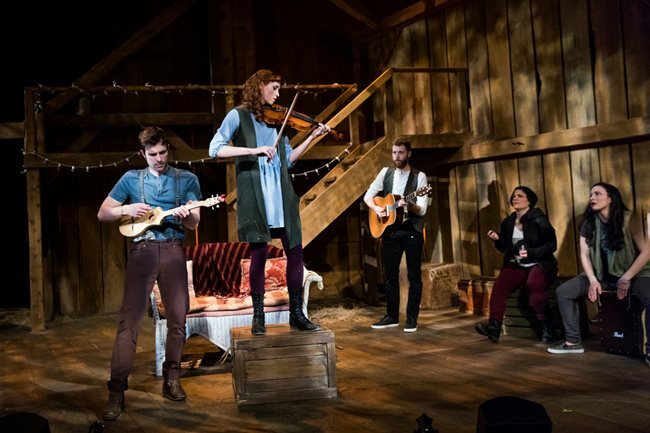 It is at times a sort of one-man show (though with six performers) where the cast speaks directly to the audience, breaking the fourth wall to inform us about the history of Ireland. But at times they fall into character as friends at a party, bantering and horseplaying with each other, ignoring the audience. The cast plays their own music. 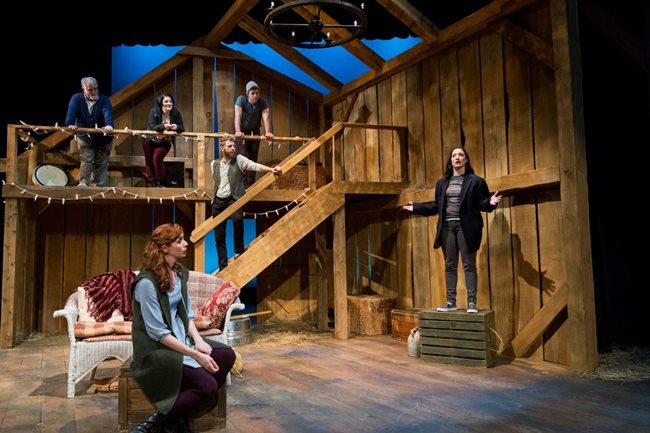 It takes place on a stage, with staging by Shelley Barish, that’s set up as a barn that may still be in use, to note the hay bales, but may not be in use, to note the piano. Lighting by Karen Perlow is straightforward. The cast, William Gardiner, Nile Hawver, Michael Levesque, Kirsten Salpini, Nicole Vander Laan, and Ceit Zweil, alternate between playing period music that follows the advancing historical timeline, and commiserating with the audience with weighty topics of Irish history. The show has no character arc, no plot, and no names are given in the performance or program. Instead it’s more of a spoken word and music show that follows Irish history of 1700 to 1940. We never learn if they’re supposed to be in America or Ireland, or if they’re family or just friends. So let’s do away with the theatre and take the show as a concert. From this perspective it is rich and beautiful. The songs are beautifully performed, moving, and well matched to each era. For example, you’ll hear a heartbreaking rendition of Danny Boy, set into historical context of parents sending a son away from Ireland to America. The instruments played change for each song, being off-and-on a piano, guitar, other stringed instruments, and a wide variety of percussion. I was glad that the cast used microphones, so they need not worry about projecting to the entire audience. Some of the songs were hard to understand and needed crisper diction or even perhaps lyrics projected onto a wall or handed out with the program. Kudos to Kirsten Salpini, who has shone in many other productions including The Donkey Show and Murder for Two, for both music direction and taking a role in the show. The choreography and playful antics amongst the cast added variety and offset the dark tone of the show. Just about everyone in the cast got a chance to beat their hands on an unusual percussive instrument. William Gardner’s playing the spoons was especially delightful. You’ll also learn a lot about history, which is fascinating. The Irish have suffered greatly and deserve acknowledgement for their past. I’m going to give the show a hearty 4 stars, so don’t worry, it’s all going to work out. But first, in a grand Irish tradition, some complaining. First, have you ever had lunch with someone who will not stop talking about their hospital problems? You would be a horrible person to shut them down, but it’s very heavy, too much for the agreed-upon context of polite lunch conversation. The first act of The Irish and How They Got That Way is unrelenting tragedy, told with bitterness. I didn’t know I was getting in for this in “a musical celebration of Irish heritage filled to the brim with humor.” Most of the humor in the show is dark. I don’t believe anything is untrue in the show, but it seems one-sided, almost propaganda. The Irish Civil War and the Troubles don’t come up. We don’t hear about Catholic Church scandals or stifling views on abortion rights. The Irish corruption at Tammany Hall is played off as funny. So much time is spent on the potato famine that the show peters out before World War II, when Ireland was neutral. John F. Kennedy wasn’t killed for being Irish, but you wouldn’t know it from this play. Second, you’ve heard the phrase “show, don’t tell”. It’s a shame that we hear about this misery second-hand through the performers, instead of experiencing it through storyline and character arcs, for example how poverty is portrayed in Charles Dickens’ A Christmas Carol. The magic of literature is that it takes the tangled web of real life and extracts a theme, a thread, that teaches us something about the human condition. This play is more a one-sided argument to make us pity the Irish, with music. Third, the play is titled “The Irish and How They Got That Way”, implying that we’ll learn something about the character of the Irish. But the show has no takeaway that gives insight into Irish culture, instead being a series of disconnected historical lessons. The play has no dramatic conclusion at its end. It just stops with a list of celebrities and ends with U2’s “I Still Haven’t Found What I’m Looking For”, as though suggesting that the Irish have no sense of self-identity, something which surely isn’t true. Ireland is #11 in the world in social progress, with plenty of unique history, culture, and holidays. Fourth, I’m a quarter Irish and I don’t think I’ve ever been tempted to play the Irish card for empathy. Obviously, every culture deserves to be understood and heard. But a show on Jewish immigrants can connect to the antisemitism of today. A show on black history connects to the racism of today. What is the connection of all this Irish history to today? The show’s history ends around 1940, so we don’t get to find out. This lost connection is important to offset the understandable assumption that like all white people, that the Irish are doing relatively well today. Ireland is the world’s 7th richest country by GDP per capita, and Irish-Americans are better educated, earn more, and more likely to earn a home than the average American. Of course Irish history is worthy of discussion, but in the time of Black Lives Matter, we could have used a bridge to access this history will full empathy. In my fantasy, the play might be adapted thusly. A family with names sits for Sunday dinner and a little girl asks, why are the Irish so sad? Then the point of the production would have been to explain it to her, and at the end the little girl would have understood and said something deep that wrapped it all up. Well, well, well! If you think I’ve complained too much, you’re both right and you’ve also got a feeling for the Irish, as presented by this show. It’s not much of a theatre show, but it’s a great concert with heart and history. 4 stars.